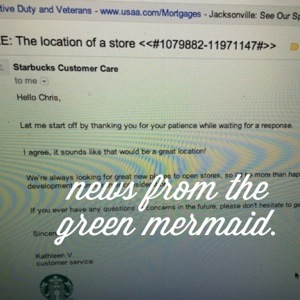 Last week I published a note I sent to Starbucks. They replied. The news is not great, but it is certainly not at all bad. Let me start off by thanking you for your patience while waiting for a response. I agree, it sounds like that would be a great location! We’re always looking for great new places to open stores, so I’d be more than happy to pass along your comments to our store development team for their consideration. If you ever have any questions or concerns in the future, please don’t hesitate to get in touch.